It's Lovely! I'll Take It! : Where'd it go? How'd it get out? What was it? On one hand: a clean bathroom, nice stager-style towels, plenty of sunlight. On the other hand: A GIANT, OPEN CAGE. That's where the parents put the kids for "Time Out." Couldn't they have discreetly left that out?? I'll take a mysterious empty cage over the bugs and fogger on the floor any day. I assume they would take the cage and the associated dog with them when they go but that house has no foyer and is decorated as boringly as is humanly possible. 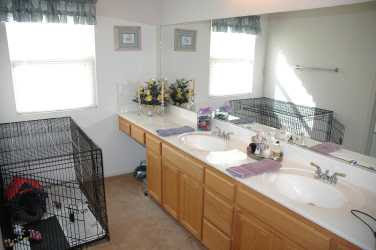 I've watched this realtors site for years, and they never seem to manage to call the sellers before photographing. At least, that's what I tell myself. On this one, a simple cropping would have helped. Ugh..Is that carpeting in the bathroom?